LIVE OFF THE RENT ! ! ! Remodeled Mansion Mobile Home, and two updated (2013, 2014) apartments. 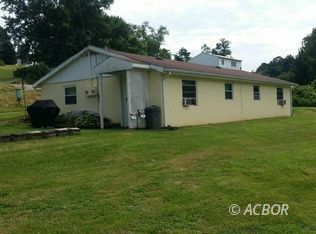 Located in a quiet country setting, but only five minutes from Athens/Ohio University - perfect RENTAL INCOME. Live in Mobile Home and rent apartments while paying off mortgage ! Athens City Schools. Mobile home has HVAC (2013) still under 10 year warranty, new metal roof, vinyl sidiing and double pane windows. All electric wired with a backup feed for a generator and propane. Leax rural water system. Both apartments have been completely updated with hot water heaters, flooring, plumbing and light fixtures. Large out building on large lot with lots of wildlife. Owner had originally planned to stay on forever thinking to update everything. Due to change in plans, he is now selling, his loss your gain ! This is a NICE, PEACEFUL, HOME, INVESTMENT, property that is already generating rental income - both apartments have excellent rental histories. Each apartment is One Bedroom (575 sq ft) and currently rents for 475.00/Mo. The apartments are super nice and owner has NEVER had trouble renting them (rents via work of mouth). This is a one of a kind money maker that wont last.